As if to bolster the Czar's self-image during his most trying times, Fabergé presented Nicholas with a series of eggs commemorating achievements of the Romanovs. 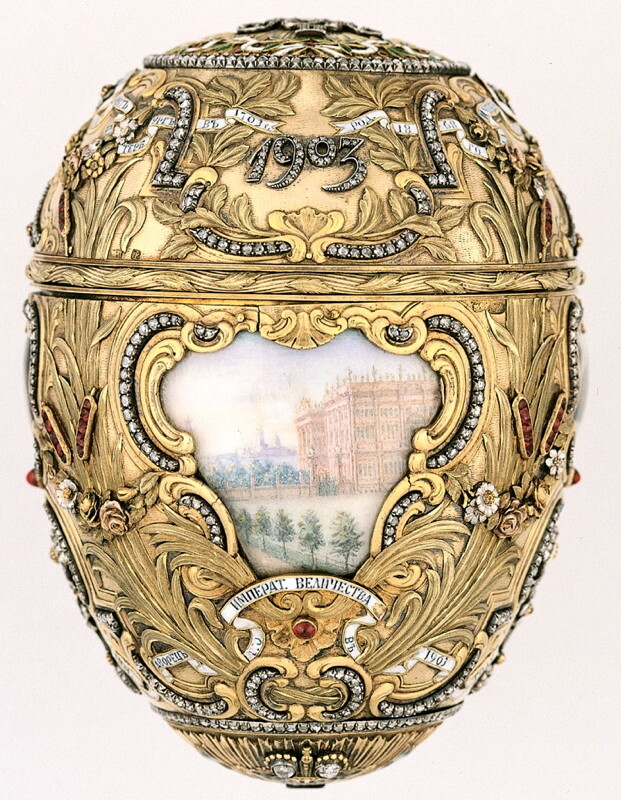 In lavish Rococo style, this Peter the Great Egg celebrated the two-hundredth anniversary of the founding St. Petersburg in 1703 by Peter the Great. The egg is in the rococo-revival style and was inspired by a French nécessaire with a clock that is still in the Hermitage. Executed in varicoloured gold, the curves are set with diamonds and rubies. The bulrushes are chased in 14-karat green gold. The spikyheads are set with square rubies. The body of the Egg is rich in symbolism. In Russia roses and laurel leaves represent triumph and pride. The bulrushes shown in our image to the left and right of the portrait are there to symbolise the marshy land upon which Peter the Great built the city that bears his name. 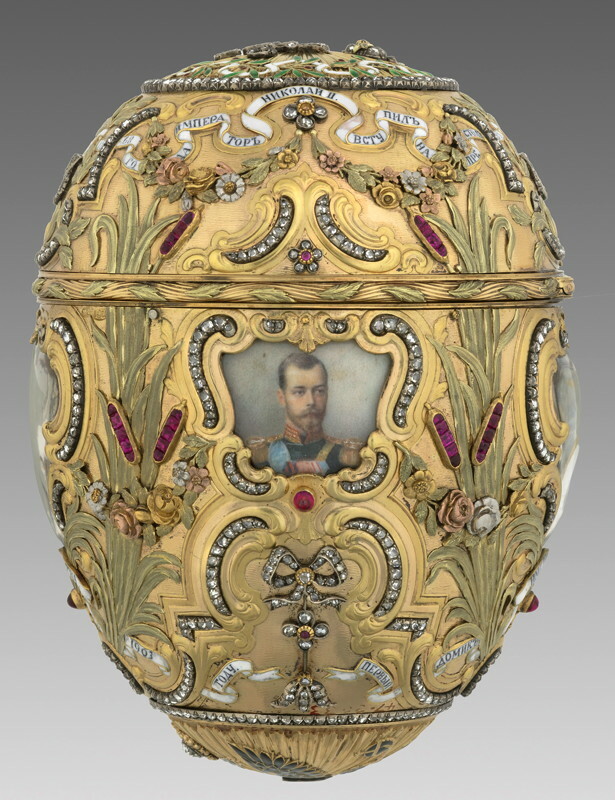 While the portrait of Nicholas II appears on one side of the Egg, Peter the Great's portrait appears on the opposite side. Apart from the portraits, the shell of the Egg bears two other watercolour medallions, which incidentally are painted on ivory and covered with rock crystal as opposed to glass for protection. At the back below 1703 in diamonds is a painting of the humble log cabin which is said to have been built with Peter the Great's own hands on the site of Saint Petersburg. By contrast, at the front of the Egg under the date 1903 in diamonds, is a painting of the impressive and luxurious 1000 room Winter Palace at which Nicholas II resided and entertained. The side miniature of Peter the Great is signed B. Byalz and has the initials of assay master Iakov Liapunov. The other three miniatures, also by B. Byalz, show Peter the Great, the wooden hut that is traditionally said to have been built by himself, Nicholas II and the 1.000-room Winter Palace as it was in 1903. Each of the miniatures is covered by rock crystal. White enamel ribbons inscribed with historical details encircle the Egg. The inscriptions read, "The Emperor Peter the Great, born in 1672, founded St. Petersburg in 1703" and "The first little house of the Emperor Peter the Great in 1703". The other inscriptions read, "The Emperor Nicholas II, born in 1868, ascended the Throne in 1894" and "The Winter Palace of His Imperial Majesty in 1903". Fabergé invoiced the Emperor 9760 roubles for this Egg in 1903. In 1927 the Soviets valued it at 16,008 roubles. However, the USSR's Antikvariat sold it to an unnamed buyer in 1933 for 4000 roubles. The buyer could well have been Alexandra Schaffer of New York's Russian Imperial Treasures Inc. In 1941 the Schaffers formed a partnership with A la Vieille Russie (ALVR) of Paris and the Russian Imperial Treasures became ALVR of New York. Mrs Pratt agreed to purchase the Egg in 1942 for $16,5000. She paid for it in 33 monthly instalments ranging from $150 to $750 from February 1942 through to December 1944. Today, the Egg is probably worth upwards of $25 million. 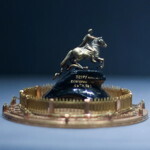 The surprise is that when the egg is opened, a mechanism within raises into position from the lower half of the shell a miniature model in gold of Peter the Great's monument on the Neva, made by Georgii Malychevin, resting on a base of sapphire. 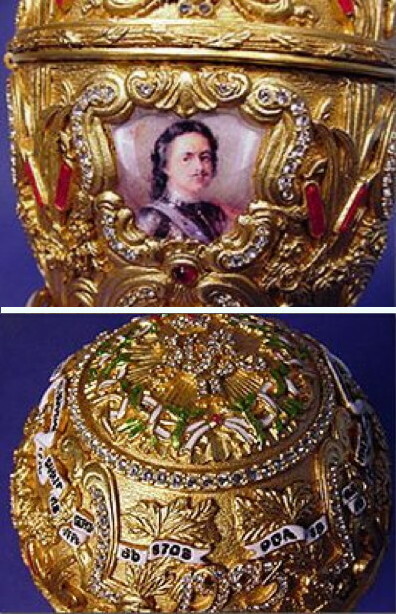 The clasp of the Egg is the Romanov Double Eagle. The reason for this choice of surprise is the story of a legend from the 19th century that says enemy forces will never take St. Petersburg while the "Bronze Horseman" stands in the middle of the city. The equestrian statue of Peter the Great, created by the famous French sculptor Etienne Maurice Falconet, depicts the most prominent reformer of Russia as a Roman hero, and stands on Senatskaia Ploschad (Square), facing the Neva River and surrounded by the Admiralty, St Isaac's Cathedral and the buildings of the former Senate and Synod, the civil and religious governing bodies of pre-revolutionary Russia.